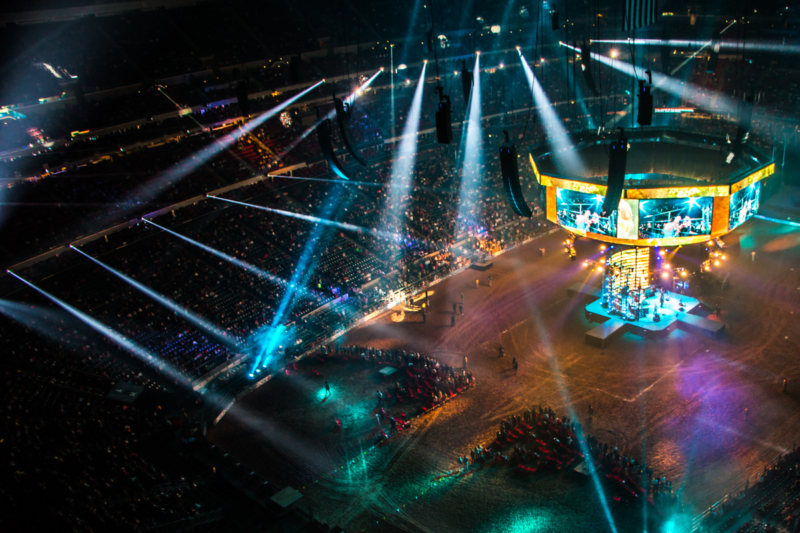 HOUSTON -Sixty Robe ROBIN Pointes and five Robe ROBIN DLS Profile fixtures ‘rode the rig’ at the 2014 Houston Livestock Show & Rodeo at Reliant Stadium in Houston, Texas throughout the month of March. Locally based LD Systems provided products, technical management and production for the entire Reliant Park and fairgrounds, using new Robe products for nightly performances by star entertainers. Performers included Brad Paisley, Eli Young Band, Reba McEntire, Usher, Chris Young, Selena Gomez, REO Speedwagon, Jason Aldean, Jake Owen, Maroon 5, Keith Urban, Hunter Hayes, Luke Bryan, Florida Georgia Line, Blake Shelton, Easton Corbin, The Band Perry and Zac Brown Band. For 20 consecutive nights, the LD Systems stage lighting team of lighting designer/programmer John Dickson, programmer Nathan Brittain and crew chief Jim Brace worked with a number of guest stage lighting designers to cap off each night of rodeo activities with musical performances. Sixty Robe Pointes encircled the inside of the stadium which seats 76,000. The fixtures were positioned on two levels with 30 Pointes each on the bottom and third level of the seating areas, utilized primarily for aerial effects. The Pointes came into action early in the evening starting with the National Anthem being played over the PA system. This signaled the start of the rodeo championship activities. Using the colors red, white and blue some of the Pointes’ precision beams ‘marched’ along in unison with the song and then alternated see-sawing effects in the air, while other Pointes projected custom star gobos to cover the seats and swirl around the dirt floor of the stadium. After hours of events, and once the calf wranglers, bull riders, and tiny tots – hoping to ride wooly sheep, referred to as “mutton bustin’” – left the arena, it was time to rock. A custom-designed stage set on wheels, which rotated constantly at 360°, was driven to the center of the stadium. It was aligned under a circular stage lighting rig with eight curved truss arms. A transparent semi-circular LED wall served as a visual backdrop. Perched on top of the curved truss above the LED wall were the five DLS Profile fixtures, which were used for the artists’ back-lighting onstage. LD Systems recently purchased 13 x DLS Profile units for their state lighting inventory, deploying five of them for the first time on this event. The Pointes were also used during the concert portion of the evening, when guest LDs requested certain colors or patterns to be projected and enhance their stage design. “It was almost like a product showcase, night after night for 20 nights,” Dickson said. The concerts attracted an estimated audience of 1.3 million into the stadium throughout the rodeo’s run.